Every since I got Trip, I’ve been interested in flying with my dogs. Trip is a small Sheltie, and while larger then some of the toy breeds that commonly fly, is not so large as to cause any real issues when traveling. She has flown numerous times on several different airlines, and we’ve really never had an issue. Ticket is a little bigger, but I still want the option of flying her in-cabin. Because of her size, I have had to get a lot more creative, and I’ve looked at many options. I’m going to review three different bags that I own and like. I’ve only flown with one bag, the Large Sturdibag. This is Trip’s go-to bag, and works wonderfully for her. I also own an Extra Large Sturdibag, which is big enough for Ticket, but poses some potential issues. Finally, I recently bought a new bag that I LOVE, a Large Backpack-o-pet from Celltei, which is what I’m going to focus on reviewing today. Next time, I’ll discuss the Sturdibag options. 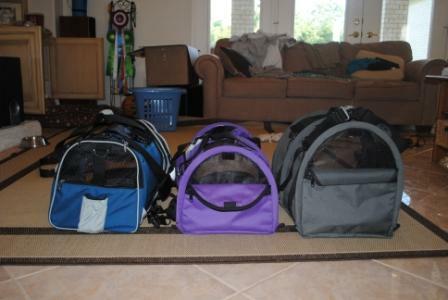 Our bag models are Trip (15 pounds) and Ticket (20 pounds). In the above pictures, you can see the relative difference in sizes of these bags. So, in my search for a bag for Ticket, a friend recommended Celltei bags. They have a large line of different styles and sizes of bags, AND can even customize them. After many emails back and forth with Angie, the founder of the company, I decided to try a large-sized bag, even though I had my doubts about Ticket fitting into it. The large is 20″ L x 11.5″ W x 12.5″ H. The large size comes with two detachable hard plastic frames. These can be removed if you will need to squish the bag under an airplane seat, or left in to provide a little more structure. There is also a rimmed tray in the bottom, which is also detachable. There are other cool features for the different styles that you can read about on their website. Based on Angie’s recommendations, I chose the Backpack-o-pet model. 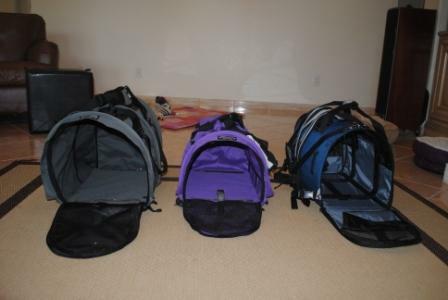 While I’m not sure I will ever use the backpack straps, they are completely detachable. It was very comfortable to carry Ticket on my back, so I can see the benefit. I also chose the “outdoor” model, which features a grey interior instead of black. We hoped this would help Ticket blend in more and not look so large, since she is a light color. When deciding on a bag, I was very concerned that the height of the “large” bag would be too small. I could not have been more mistaken–it’s a perfect fit. The biggest constraint seems to be the length–Ticket if very long-bodied, so she’s slightly more compressed then I would like. If I chose, I could elect to get a custom bag with an extension, where I could unzip an additional few inches of length. They have many other custom options as well–it feels like if you can dream it, they can do it. I LOVE this bag. They are a little expensive, but I feel they are well worth the price. The construction is extremely sturdy. Even without the hard plastic frames, there is a good structure to the bag, yet you can easily see how it will fit under an airplane seat. I definitely feel like Celltei is the company to go with for pet carriers, particularly with dogs that are a little bigger. It’s an amazing product that I look forward to using for many years. I will definitely post an update when I actually fly with the bag–no matter who travels next time (Trip or Ticket), I plan to try this bag out. If you’re local and want me to bring the bag to a show for you to check out, just let me know.